Day 4 – The Chocolate Chip Cookie Okay, so this cookie really doesn’t say the Holidays but since today is National Cookie Day I thought what better way to celebrate than with the quintessential American Cookie. Legend has it that the origin of the cookie comes the Toll House Inn when in 1930 Ruth Graves Wakefield was making a batch of cookies and ran out of the chocolate she usually used for them. Thinking they would melt she substituted another kind of chocolate at the end of the mixing and then baked them off. 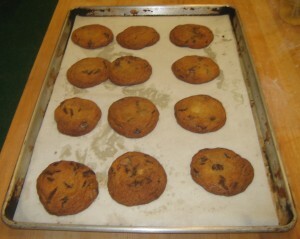 Well the chocolate didn’t melt but stayed imbedded in the cookie and the Chocolate Chip Cookie was born! We get compliments on our chocolate chippers all the time and I’ll tell you why they are so good – they are made with real good quality ingredients. We use Cabot unsalted butter, King Arthur “special” flour and a very fine quality chocolate. I can’t say which chocolate because if Slugworth or Ficklegruber read this and found out, then they would copy the idea for their own cookies.